Cedar plank cooking is a special way to grill foods to add a unique and savory aroma and flavor to many grilled foods. Basically you sit your food on a thin plank of cedar wood and as it heats up on your grill it releases aromatic smoke that envelopes and permeates the food. Similar to using smoking woods while grilling, but using a cedar plank seems to impart an even stronger cedar smoke aroma and flavor to the food. The most classic and traditional dish for this type of grill cooking is cedar plank salmon. Something about the rich flavor of a good salmon steak or filet is beautifully married with the smokey aroma of the cedar. However, other meats and even vegetables can be enhanced by this style of cooking as well! What Kind of Cedar Planks Should You Use? Cedar plank cooking is always done on Western Red Cedar boards. Eastern cedar is not safe to cook on, it can contain toxic resins! The planks used are generally thin, only about a half a centimeter in thickness, and are usually about 12 by 6 inches in size. The exact size or thickness is not important as long as it fits the food you plan to cook completely on top of the plank. While you can theoretically use any Western cedar you find, you want to be completely sure that your source is pure without any type of treatment or added chemicals. Some cedar sold at hardware or lumber suppliers has been treated and is thus not suitable for cooking. Your best bet is to buy cedar planks which have been sold specifically for the purpose of cedar plank cooking. 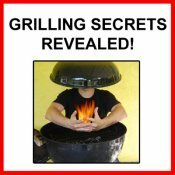 These can be found at most places that grilling supplies and equipment are sold and in many specialty grocery stores. You can even find other wood types that can be used in a similar way but impart different flavors like apple wood, pecan and others. Cedar plank cooking is actually pretty easy. The first step is to soak your planks in tap water. Most people recommend first rinsing (to get rid of any dust or debris) and then soaking for at least an hour and up to a day. You may need to weight the planks down with something like a soup can to keep it immersed. This helps prevent your wood from catching on fire on the grill and helps it to smoke nicely, releasing its aromatic oils. To add other aromatic flavors to your food, some people soak the cedar planks in other watery liquids such as white wine, beer, or apple cider. Do not use very alcoholic liquids like straight bourbon or tequila as they can ignite quickly on an open fire! If you wish to use them, dilute them with water or other liquids before soaking the wood. Many different types of recipes can be prepared on a wood plank. I am not discussing specific recipes here but you can do everything from a simple seasoned fish fillet to a marinated soy-teriyaki steak on a plank. The cedar aroma can accent a number of different types of recipes. Before cooking, brush the cooking side (choose the smoother side) of the plank with a bit of olive oil to help keep food from sticking. Then add your food directly onto the cedar plank. If you have large planks you can place several pieces on one plank. You can also combine foods, placing both your meat and vegetables on the plank together. After pre-heating your grill, either gas, charcoal or even wood, you place the plank with the food on it directly on your grill grate. Ideally you want it over moderately high heat but not over open flames. You don't want the cedar to catch fire. Cover the barbecue to retain heat and smoke to flavor your food. Check back occasionally to check the progress. If the edges of your plank catch fire, use a water spray bottle to extinguish the flames. If this continues to be a problem, either lower your flame or reposition the plank so that it is not over as much direct heat. Depending on the type of meat and vegetables you cook, your food will generally be ready in 20 to 40 minutes. Cooking obviously takes a bit longer than cooking the same meat directly on the grill since the cedar plank cooking insulates the food from the direct heat somewhat. 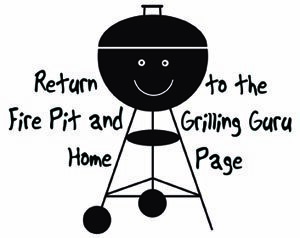 Instead your food is cooking more from the indirect, ambient heat within your barbecue. For a great presentation, when done you can serve your cedar plank cooked foods right on the plank. Just place the plank on a heat-proof serving tray and bring to the table. Use a spatula to gently lift the food from the plank to serve. What Kinds of Food Can You Cook on a Cedar Plank? While cedar plank salmon is the most classic dish prepared in this way, there are many variations that can be delicious. For example, sticking with salmon, the fish can be prepared simply, rubbed with olive oil, sprinkled with salt and pepper and then cooked on the plank. Alternatively, you can marinate the fish first in any number of marinades, from dill and white wine to a sweet teriyaki sauce. 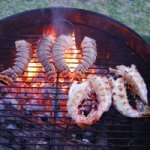 The flavor imparted by the cedar can be quite strong so I generally tend to like it either with a simply prepared dish or with something with a hearty flavor which can stand up to the cedar aroma (like teriyaki or barbecue sauce). Other fish can work too but look for fish with firmer flesh like tuna, shark and even large scallops. Softer, delicate fish can often stick and fall apart easily and their delicate flavor may be overpowered by the cedar smoke. Many other types of meats can shine on a cedar plank. Beef, chicken, turkey, and pork all work well. For richer meats like steak, you may want to sear both sides of the meat first on the bare grill to get nice caramelized grill marks before placing on the cedar plank. You can also grill vegetables on a cedar plank. If you are cooking other meats and you have room on your plank, surround the meat with potatoes, onions, carrots or other veggies so they can cook right along with the rest of your meal! Other woods - Alder planks have a bit milder aroma and flavor than cedar. Apple wood and pecan wood planks can also be delicious. I particularly love apple wood with many pork recipes and some chicken as well. Cedar Grilling Papers - grilling papers are ultra-thin strips of wood which are almost like paper. They are flexible and can be wrapped around foods. They are excellent for cooking smaller cuts and tender, delicate foods. They can also make a great presentation to serve your food wrapped up in the grilling paper. 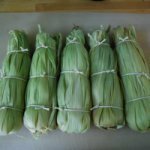 Tie them into place with kitchen twine soaked in water. Done learning about Cedar Plank Cooking?